There are so many high quality frozen uncooked chicken products that you can buy straight from the supermarket and use to prepare delicious meals, reducing your food waste and household bills. All of our tips are for using chicken commercially frozen – this is uncooked chicken that has been frozen by the manufacturer, ensuring it is of the highest quality and can be cooked safely from frozen. Please note: Frozen chicken should never be defrosted at room temperature as this is when bacteria can multiply rapidly. 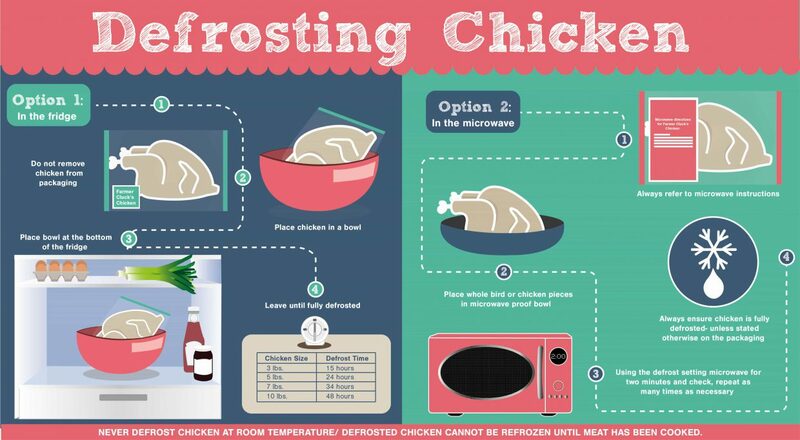 Always ensure chicken is fully defrosted – unless stated otherwise on the packaging. Never defrost chicken at room temperature. Defrosted chicken cannot be refrozen until the meat has been cooked. This is the slowest but safest method of defrosting chicken. Remove any packaging before placing the meat in a microwave-safe dish to catch any dripping juices. Using the defrost setting, defrost for two minutes at a time, checking the meat’s progress as you go. Once the chicken has been defrosted, it should be cooked straight away. If in doubt, make sure to refer to the product’s instructions on the packaging. Never refreeze chicken once it is defrosted. However, it is safe to freeze the chicken once it is fully cooked. Want to read more? We’ve created guides on how to defrost chicken, fish, sausages, turkey and mince.